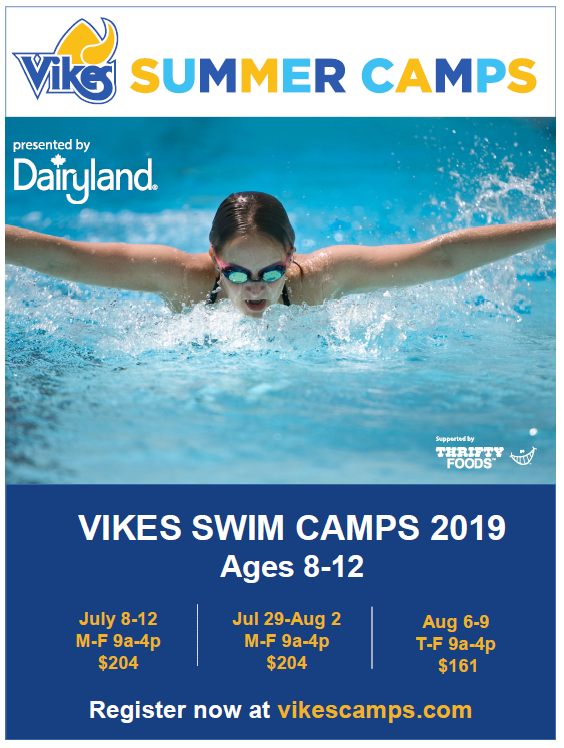 Our Vikes swim camp introduces children to the arena of competitive swimming. Our experienced coaches will lead the campers in stroke improvement, swim games, swim fitness, dry land skills and provide an opportunity feedback from under/over water video. Participants must be able to swim 50 meters or be at a Lightning Fast 3/Red Cross Level 6 or higher. Classes are co-ed for children ages 8-12. Here is a list of upcoming camps. For more information about the Vikes Recreation Program go to VikesCamps.com or call 250.472.4000 for more information.